From wireless sensors to real-time information to advanced 3-D visualization techniques, the era of data has arrived. 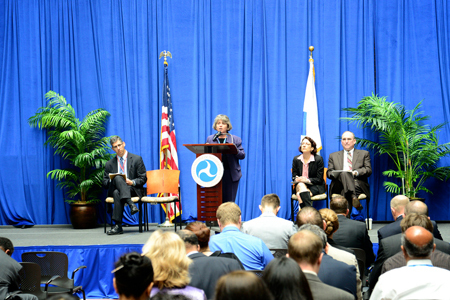 At the U.S. Department of Transportation's (USDOT) Data Palooza, held May 9, 2013, at USDOT headquarters in Washington, DC, nearly 200 participants discussed innovative technology solutions that enhance transportation system performance, reduce congestion, and improve safety, among other benefits. These data solutions are being realized through improved public and private sector collaboration. "We need credible and reliable data," said Peter Stephanos, Director of the Federal Highway Administration's (FHWA) Proposed Office of Transportation Performance Management. "We need to use that data to turn it into information and then use that information to make smarter decisions." Data Palooza sessions focused on acquiring, processing, and using data, with 37 presenters and 23 technology exhibitors. Sessions were also available via Web conference. Today's supplementary and alternative data sources and real-time data are improving transportation reporting, decisionmaking, and performance across the country. Bill Toothill of DBI Services described, for example, how vehicles specially equipped with high-sensitivity cameras can collect data on sign retroreflectivity while traveling at highway speeds. This method is more cost effective, improves safety for highway workers, and allows transportation agencies to assess signs from a driver's perspective. Data processing, meanwhile, has been enhanced by 3-D visualization and other new techniques. As highlighted by Rebecca Crowe in FHWA's Office of Safety, the use of 3-D visualization in road safety audits (RSA) enables members of an RSA team to better understand proposed roadway improvements and identify potential safety concerns. The 3-D model, for example, can be used to illustrate exactly how the roadway environment will be affected by signs, structures, guardrails, and other key features. The 3-D model also allows the team to view the proposed roadway conditions from any number of vantage points. This may reveal problems not obvious from a review of standard 2-D plans. "Using 3-D visualization brings a static design to life," said Crowe. More information on 3-D visualization will be available in a forthcoming FHWA Road Safety Audit case study, Using Three-Dimensional Design Visualization in the Road Safety Audit Process. Expected to be released this fall, the case study will be posted on FHWA's RSA Web site at http://safety.fhwa.dot.gov/rsa. 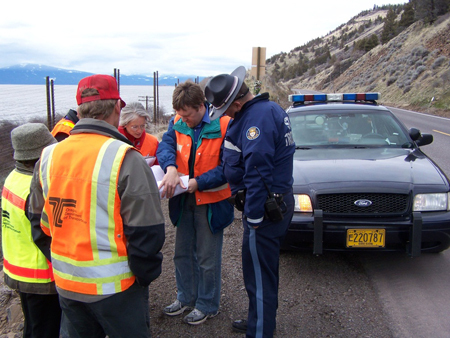 Data processing is also helping State highway agencies improve performance. The Ohio Department of Transportation (ODOT) developed a Snow and Ice Recovery Evaluator program to objectively grade the agency's winter maintenance efforts. This is part of ODOT's Critical Success Factor initiative, where the agency rates itself on factors ranging from pavement condition to safety. The evaluator analyzes roadway speed and weather data and issues reports monthly, scoring each of ODOT's 12 districts on their performance for the preceding month. If a district recovers from a snow event in less than 3 hours, based on an evaluation of roadway speed, it receives a score of 100 percent. "Before this winter we determined our thresholds for starting and stopping a snow event by modeling historical events," noted John MacAdam of ODOT. For an event to start, at least 5 percent of roadway routes must have an average speed of at least 16 km/h (10 mi/h) slower than normal, while at least 25 percent of ODOT's road weather information system stations must report snow or ice. ODOT plans to refine the program thresholds before next winter and would also like to develop the evaluator into a real-time program, instead of looking back at the preceding month. In Washington, DC, data is being used to improve traffic management. The District Department of Transportation's (DDOT) Wireless Detection Project is using wireless sensors at 142 major arterial locations to collect such data as traffic speed and vehicle counts. These data are then used to create a real-time congestion map that aids DDOT personnel in managing traffic and responding to incidents. Data are also aggregated and archived 24/7 for future planning purposes. To learn more about data solutions that are changing today's transportation system, visit www.fhwa.dot.gov/tpm/events/datap_agenda.cfm. Data Palooza session presentations and recordings are available, as well as the event agenda. For more information about Data Palooza, contact Michael Nesbitt at FHWA, 202-366-1179 (email: michael.nesbitt@dot.gov). The use of 3-D visualization in road safety audits (RSA) enables RSA teams to better understand proposed roadway improvements and identify potential safety concerns.